Oyster connoisseurs from around the world converged on the Bluff Oyster and Food Festival to consume the delicacy on Saturday. Whether they were au naturel, succulent and juicy, dressed in batter, Kilpatrick or a variety of other ways, more than 20,000 oysters were consumed, Bluff promotions officer Lindsay Beer said. 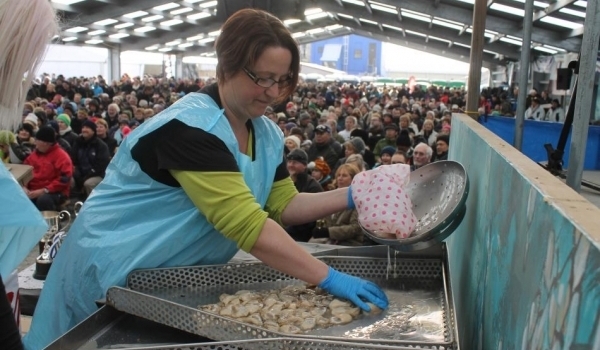 An estimated 4500 people flocked to enjoy the food and be entertained by music and oyster-opening and oyster-eating races. Mr Beer said 75% of patrons came from outside Southland, some from as far away as Australia, South Africa, the United Kingdom and China. Two charter flights from Auckland and one from Wellington transported about 450 people to Invercargill before they were bussed to the festival and other attractions in the area, including Transport World and Invercargill Brewery. Not only oysters were in demand at the 13 festival food stalls; many other delicacies such as muttonbirds, kina, pork belly, venison, scallops and crayfish delighted festival-goers. Mr Beer said the crowd had been ‘‘great’’ and everyone had had a good time. Retired All Black Mils Miliaina was one of the competitors who consumed 10 oysters during the men’s oyster-eating race. However, it was Daryl MacDonald, from Blenheim, who won the men’s race, for the second year running, while Kathryn Gifkins, of Inglewood, Taranaki, won the women’s race. Shane Wixon, of Ngai Tahu Seafoods, won the men’s oyster-opening, shucking 50 in 2min 36sec. 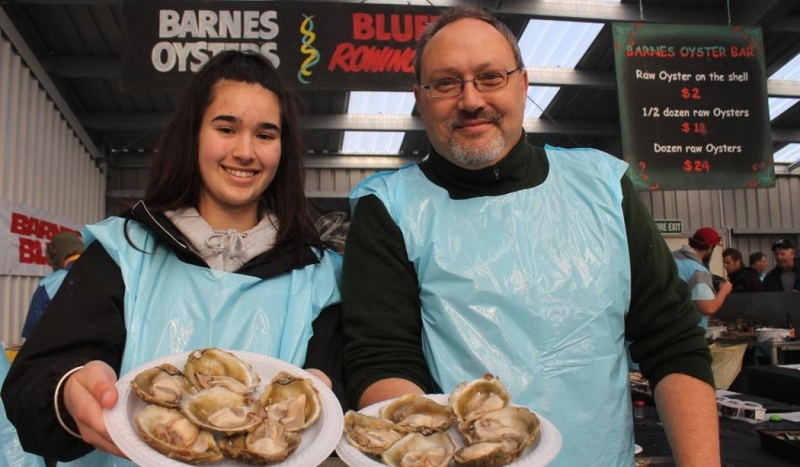 In the women’s section, Vic Pearsey, of Barnes Wild Bluff Oysters, made it seven years winning in a row when she opened 50 oysters in 2min 43sec. Mr Wixon also won the blindfold oyster-opening race, opening 10 in 34.2sec. Barnes Wild Bluff Oysters’ team of four won the oyster-opening relay event, shucking 20 each in 5min 16sec. Mr Beer especially thanked all the volunteers who had grappled with Friday’s weather and turned up on the Saturday to set up and man the festival site.